“Paraguay is a perfect beta tester” is what we heard a lot of times during our first trip to this country. Looking at Latin America, Paraguay is today one of those terres inconnues (‘unknown lands’ in English) in terms of tech and high impact communities. This is even truer if you consider just South America. While it is hard to describe what it is like to travel in this mysterious territory in only a blog article, we will try to give you a taste! We have always been interested in this landlocked country in the middle of South America, but we only got the chance to go on the ground this year. The trip started with a crazy bet and invitation from Miguel Salomon, Head of Open Innovation & Business Analytics at the BBVA Paraguay bank. It is true that we were very intrigued by the organic growth of the Paraguayan deal flow of startups just by looking at the number of applications at the BBVA Open Talent, the bank’s global competition for fintech startups. An interesting fact is that Paraguay has less than 7 millions inhabitants, far from the market size that usually would make venture capitals’ investors rub their hands and attract entrepreneurs to launch or expand a business (for benchmark: Brazil has 200M, Argentina 45M and Bolivia 11M inhabitants). Paraguay’s population is actually the same of Switzerland’s, while its territory is as big as Germany’s. More importantly is that Paraguay has been witnessing a continuous growth of an average 4.5% per year since 2004. The local currency Guarani has been very stable in recent years and is probably one of the steadiest in the LatAm region. The overall macroeconomic stability is one of Paraguay’s key advantages to attract foreign investment. Another interesting aspect of this country is its GDP per capita. Paraguay’s GDP per capita is almost 20 times lower than that of Switzerland ($5,618 in 2018 according to the Paraguay Ministry of Industry and Trade), while nearly a quarter of Paraguayans still live under the poverty level. Looking at the economic sectors, the main driver is still agricultural production. In fact, Paraguay is one of the biggest global producers of meat, soybeans, stevia and electricity. Surprisingly enough, almost 100% of the country’s energy production is hydraulic and therefore renewable. For this reason, they have several important dams such as Itaipu, the second biggest dam in the world. Because of the surplus in production over the domestic consumption, the excess energy is sold to neighbouring countries such as Brazil and represents around 70% of Paraguay’s exports. That’s when we introduce Juanjo Benitez Rickman, one of Paraguay’s early crypto adopters, who decided to leverage the low-cost energy by creating bitcoin.com.py, a bitcoin mining company. 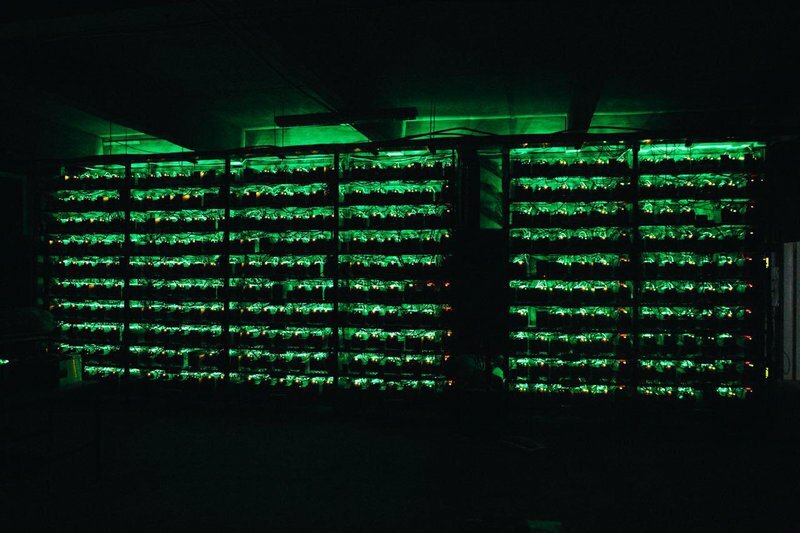 Today Paraguay is one of the cheapest places in the world for bitcoin mining, with an average price of 5 ct/Kwh (for benchmark: Argentina’s electricity cost around 10 ct/Kwh). However, there are further opportunities than crypto mining: cryptocurrencies also offer an alternative way to transfer money and invest. For example, bitcoin.com.py has just started to provide bitcoin buying and selling services, and Cripex, a currency exchange platform, has begun its operations in 2017. Moreover, applying blockchain technology in agro industry could boost the country’s efficiency in terms of traceability and could also foster increased government transparency and efficiency on a public level. Paraguay ranks #132 in the Corruption Perception Index this year. As for most of Paraguay’s neighbouring countries, corruption and government inefficiency are important challenges that have a direct impact on entrepreneurs. Besides, until today the Paraguayan government has been rather slow in terms of fostering a climate of innovation and showing support to promising tech entrepreneurs. According to Juan Ventura, Specialist of Competitivity, Technology and Innovation at Inter-American Development Bank (also known as BID), Paraguay is the second country that invests the least among Latin American countries. But this may change! Digitalising economy in order to support organisations such as accelerators and to provide funding to more advanced-stage startups. The Ministry of Information Technology & Communication (MITIC) have been supporting technology projects with a seed capital of $10,000. MITIC is now working on the design and realisation of a digital district in Asunción, a physical hub to host startups, tech companies and programs to support the development of innovation and technology. The Ministry of Labor, Employment and Social Security (MITESS) is already supporting the implementation of a FabLab, a small-scale workshop offering (personal) digital fabrication, and is willing to provide additional opportunities to democratise access to tech education and knowledge. The National Council of Science & Technology (Conacyt), with the role of supporting the development of technology, research and investigation, is providing assistance to mature projects with up to $90,000 and to innovative early-stage tech ventures with up to $25,000 through its contest ProInnova PY. The Ministry for Industry and Trade (MIC) is greatly engaged to promote success cases from Paraguay through the campaign #InnovaPY. More importantly, MIC is in charge of writing and proposing a new law, “Ley Fomento de Cultura Emprendedora” or “Law for the Promotion of Entrepreneurial Culture” in English, that should implement entrepreneur-friendly measures such as an entrepreneur visa, a maximum of 30 days to execute a payment for SMEs (small and medium sized enterprises) and online processes to open a company within less than a day. The government has been trying to support some projects in the past five years without clearly establishing well-designed and ambitious initiatives. The new ambitions are certainly promising as long as they are implemented by people who know the needs of innovation and entrepreneurs. In the meanwhile, the private sector has not been much involved yet. Koga is the main and probably the only active startup accelerator today. Founded in 2015, Koga had initially the mission to train social entrepreneurs, but rapidly switched to target a larger range of entrepreneurs by accepting different types of startups because of the lack of deal flow. Koga has recently launched an angel network and now acts as an ecosystem builder, hosting various events and activities in the field. It goes without saying that investors are rare, especially without a real and active investors network, but some angel investors (usually entrepreneurs themselves) have started to manage a personal portfolio of startups. Loffice is a network of open spaces, which already accounts for over 3,000 square meters throughout the city. Loffice was founded by the same partners as Koga and presents very cool design and facilities. We got the chance to host a “Get Together Aperó” with the entrepreneurs at Loffice Mercedes, which had an amazing building and a green space. It is probably in the top 10 of the most amazing coworking places we have seen in the region. Corporates have so far not been investing in venturing. Some of them, such as Unilever have social innovation challenges, but with an approach of corporate social responsibility. According to Miguel Salomon from BBVA Paraguay: “Corporates do not embrace open innovation as a relevant business strategy that could bring financial return and innovation”. Therefore, the BBVA Open Talent Competition is a very unique initiative, also because so far there is no other activity that directly provides the opportunity to Paraguayan tech entrepreneurs (or in this case to fintech entrepreneurs) to talk directly with the executive level of a bank, visit Europe (all winners are flown to Madrid for the Open Summit of the Spanish group) and get an opportunity to access up to €50,000. The BBVA Paraguay also believes that in order to increase the mass and quality of the deal flow of startups, they need to support the construction of a better startup ecosystem and create awareness or democratise the understanding of what is fintech. On this matter, Paraguay hosted for the very first time last year the BBVA Open Talk event in Asunción where they brought together over 150 attendees. The event was announced as an operation of national interest. Another interesting case of a digital corporate leader creating awareness of tech entrepreneurship is the telecommunications group Tigo (owned by Milicom). The group launched operations in Paraguay in the 1980s, at the time of the first antenna installations in Latin America. Tigo made of Paraguay its experimental land. As Raul Giucich, the founder of Momo, the winning startup of BBVA Open Talent Competition 2018, said “Paraguay es el conicho de India del grupo Tigo” (meaning “Paraguay is the Guinea pig of the Tigo group”) in reference to a laboratory experiment. In fact, Paraguay was the first country in the region to have an SMS center. It was also the first market in which Tigo launched mobile money services. Thanks to these initiatives, Paraguayans got access to new tools for commerce and inclusion through mobile technology. Today there is an average of 2+ mobile phones per person. While the Tigo group is constantly innovating and investing in upcoming product designs, it hasn’t been too involved in open innovation and corporate venturing. Though the group does have a contest, called Tigo Connecta, which promotes for social impact solutions, most of its projects are usually at conceptual stage. In spite of its implementation efforts, e-commerce is not fully wide-spread yet. Less than 10% of the population has ever used an e-commerce platform to buy a product or a service in 2017. More information about the smartphone, notebook and internet penetration in Paraguay can be found in this in-depth study from the Paraguayan government. Online purchases of products and services are still quite limited as most of them happen in cash through invoicing or local distributors. Mobile phone is the main device used to access the internet. However, this should be seen as an opportunity considering that in the past year e-commerce in Paraguay has grown at an exponential rate of over 50% (see the study above). Momo is the winner of BBVA Open Talent Competition 2018. The startup provides a platform for sales of digital and physical telecommunication products that allow operators to distribute and track their different point of sales. One of their key features is the possibility to give credits to a point of sales (usually small merchants or kiosk owners), so that they can sell digital products at any time or even for their own business. “There is a 0% default rate as not paying would detain the point of sales to distribute telecommunication products, which makes most of their turnover” explains Fabien Biedermann, co-founder of Momo. Toky was founded three years ago by two young Paraguayan engineers, Carlos Ruiz Díaz y Óscar Sánchez. They developed a software that allows to create a link connected to a phone number and attributed to a unique user, so that the user can be reached at any time no matter where they are in the world. The application also ensures data privacy in contrary to similar communication tools like WhatsApp. It also doesn't require the installation of the software on your mobile device, unlike Zoom and Skype do. Currently, Toky has a team of over 15 people located mostly in Paraguay, but also in Colombia, Mexico and Spain. They have more than 20 corporates clients in 90 countries and were recently invited to give an interview to the famous Ycombinator. Guaranglish, founded by Luis Rojas, is an app that aims to teach the Guarani language to foreigners and help Paraguayans to learn English. Their vision is to have a global coverage and promote the study of indigenous languages. They won the Tigo contest a few years ago and launched their app last September, counting over 150,000 users at the time. The founder Luis explained to us: “What is hard in Paraguay is the lack of structure to dedicate ourselves full time to our startups. I was never able to focus fully and only to the development of Guaranglish. But on the other side, one of the key advantages is the low cost to build tech platforms or applications.” Apparently, with $10-15K one can get a decent minimum viable product (MVP), depending of course on the requirements. 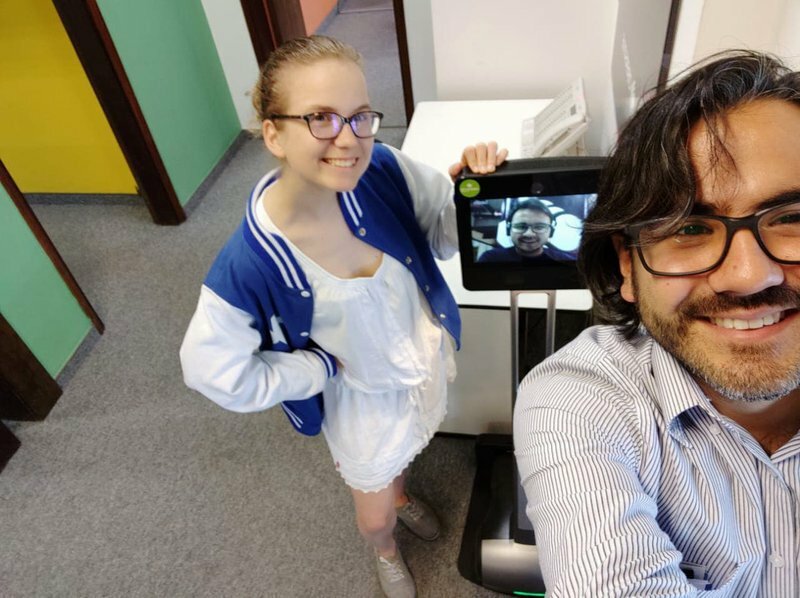 Muv is a startup born less than a year ago and co-founded by Ximena Dure, a young woman entrepreneur that, after finishing her studies in Boston, decided to go back to her home country to launch her own startup with a friend. Muv is basically a copycat of Uber, which was not present in Paraguay until last October. While the idea is not new, Ximena’s team has been excelling in the implementation and execution of the project with a very human-centered service and an activation and retention approach. From Ximena’s words: “We started something that could have been proven to work in other markets to be able to focus on the quality of the service, but we are already looking ahead and want to make of Muv something bigger than ride hailing”. A very cool fact is that Muv requires all their drivers to get a RUC number (a tax card number attributed to the company owner) and, therefore, contributing to the formalisation of drivers and their participation to the fiscal system. From a customer experience, we got the chance to test it as Uber was not able to find us a driver for our ride. We give 5 stars to Muv! Cybersons is not a startup, but one of the greatest companies in Paraguay. Cybersons develops applications and web services for different clients all around the world. It is a tech multinational born in Paraguay and co-founded by Vivianne Cibils and her husband. Both software engineers, they started their company in the 1980s from nothing until building it to such a big size that it’s now present in 30 countries. They represent some of the rare angel investors in Paraguay and have invested in nearly 10 tech companies up to this date. Those are just five examples of startups that prove one more time that talent is everywhere. Paraguayan entrepreneurs are facing very similar challenges as their peers in Latin America, Africa and Asia, for example, the overwhelming bureaucratic processes, the complicated access to capital and, in some cases, the lack of local role models. Another key issue in Paraguay is the scarcity of qualified talent to work in tech startups. When we speak about the scarcity of qualified talent is does not refer to the lack of professionals overall, but to the gap between the skills of the Paraguayan workforce and the requirements of the tech market. For example, there are too few engineers graduating per year. There are probably many reasons explaining this, but among others is the long and painful academic career of an engineering student, who takes at least six years to graduate. It happens to be so that the limited number of engineers tends to work in big corporations, which provide them with great conditions, such as a monthly salary of around $3,000-4,000 and other benefits. The English speaking workforce, on the other hand, is also not easy to find which is quite problematic in the tech industry. Considering that 70% of Paraguayans is under 35 years old, this is the right time for Paraguay to invest in education providing access to gaining new skills needed to face the important wave of upcoming automation. These skills include coding, creativity, empathy, problem solving and many more. For this reason, the key to success is to look beyond traditional education. It means not only providing new curricula, but also investing in digitisation of the country. According to a study of BBVA, Paraguay has duplicated the numbers of internet users between 2011 and 2014, yet it remains one of the countries with the lowest digitisation score, as seen in the image below. 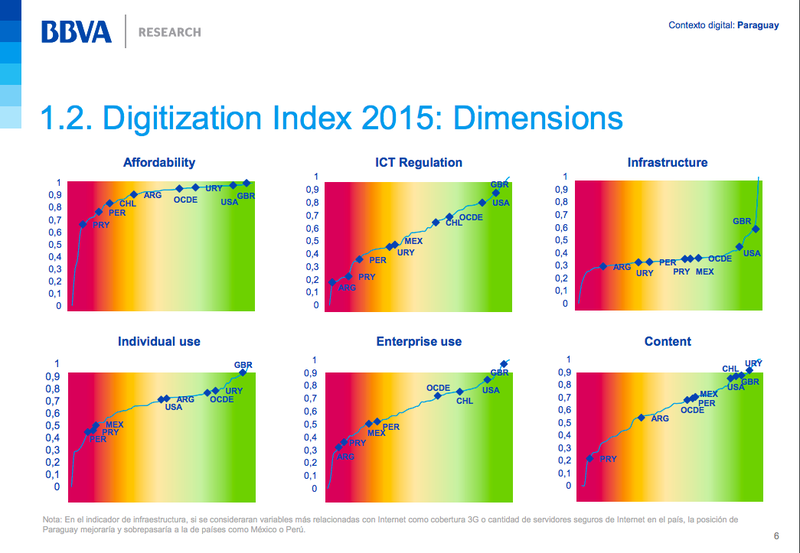 The Six Dimensions of the Digitalisation Index 2015 according to BBVA Paraguay. On the other hand, over 60% of the population is interested in accessing new educational channels, such as free online courses to study languages, marketing and web design, according to this Senatics Research from 2017 made by the Secretariat for National Information Technology and Communication in Paraguay. As final remarks, what can be said about Paraguay is that it is definitely one of the least developed ecosystems of Latin America, which, at the same time, gives it a strong potential to grow in the coming years. We believe this is the right time for Paraguay. Tech evangelists are showing up and the population is always more avid of new mobile technology. Mobile money, mobile applications for mobility, communication and education allow the people to improve their daily lives in terms of safety, access to knowledge and financial inclusion. The government is aware of these opportunities and needs to prove it can embrace them now. In spite of these challenges, we have met so much talent on the ground and witnessed the hunger of the different entrepreneurs and ecosystem enablers that it convinced to go back there soon. In 2019 the Seedstars World Competition will reach Paraguay, stay tuned!